Here are some other helpful cultural hints and facts about Japan! 1- For a city that is as jam-packed as Tokyo is, you’d think that it would be a noisy, loud city. Au contraire, friend. The only loud and obnoxious people you’ll really find in Japan are foreigners. Trains are a great example of this. I’ve been packed like a sardine, unable to move, in a train, able only to hear the whispering of two girls together. People generally do not talk on the trains or in the stations, unless they happen to be travelling together. The Japanese tend to be a shy people and very respectful of those around them, never wishing to disturb. Imagine this– in silence– for your whole commute. Now, if you’re lucky enough to dive into a recently vacated seat on one of these things, you’ll be able to sleep your way in peace to work/school/wherever. However, with much practice and an early enough commute, you’ll soon develop the skill of sleeping on your feet. 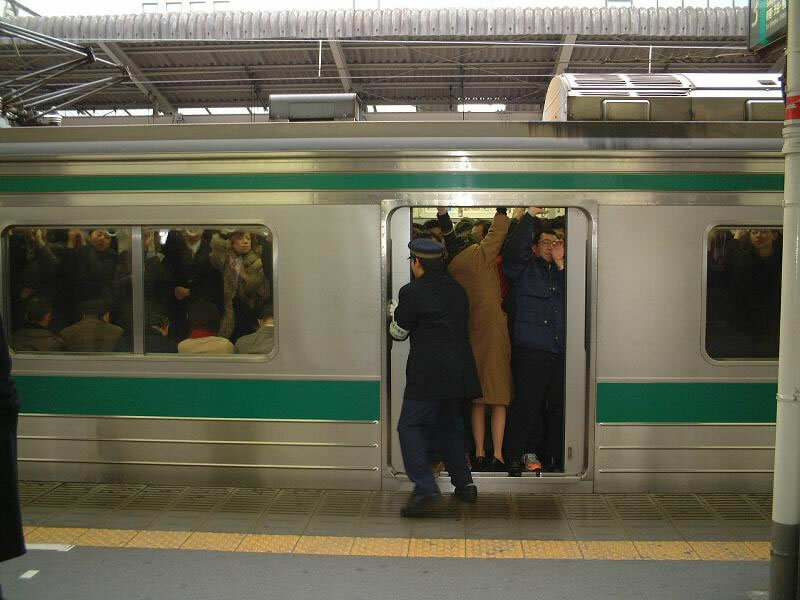 Sometimes the crowding helps in this case, you don’t have to worry about falling over– it’s not possible! Just don’t miss your stop. 2- One popular form of advertising in Japan is the passing out of tissue packets to passerbys. In two years of living in Japan, I never once had to buy tissue– I got mine on the streets. Ironically though, it is considered rude to blow your nose in public. Disgusting, actually. Constant sniffling is preferred. Should you really need to blow your nose, you need to excuse yourself and go do that in private. I once was sitting on a somewhat empty train (it was the afternoon), and there were some European foreigners sitting across and a bit down from me. One girl blatantly blew her nose and I’ve never quite seen the equal of expression on the face of the Japanese woman across from her. The girl clearly had no idea what she had done or why she was getting faces made at her. 3- So this seems to be a train-themed update. 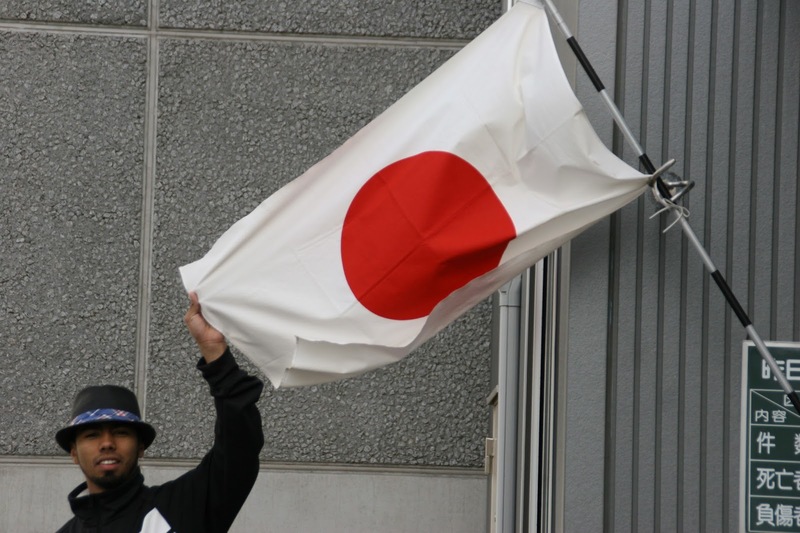 One huge issue in Japan is the suicide rate, which averages about 30,000 per year. Actually, 2012 was the first year in 15 that it has dipped below 30,000. I just read today that suicide accounts for 47% of the deaths of people in their 20s. That is alarming. Even children, due to pressure, disappointment, bullying, etc., have committed suicide. One of the most common forms of suicide is train jumping. As the train is pulling into the station, the person jumps in front of the train. While being sad and gruesome, it is also a huge problem for commuters. Employees at the train stations can be seen passing out excuse notes for those late to work. This is such a common thing that the train stations, in order to prevent this, have started charging the family of the deceased fines up to $12,000 or more the delays caused. 4- Moving on from that depressing subject to another not so awesome one. Japan has a serious declining birth rate. In June, Japan News reported that the decline in Japan’s population set another record in 2012 with the number of deaths exceeding births for the sixth year in a row. Japan needs an example of a Godly marriage and what following God’s principles will do! 5- So, this is a bit long. Let’s end it on a funky note. You don’t see people eating and walking in Japan. You just don’t. People sit and eat. You also don’t see trash cans in Japan. And you have to divide your trash. We have time of prayer at our job… break time at 9:30 every day. It’s a blessing and encouragement to be able to support and be supported and know what’s going on in each others’ lives and to come together to pray about things. Vicente and I have an upcoming trip to Texas for a missions conference. For this conference, I had blogged that I was looking for a rental car, and ended up learning another lesson about how God works things out better than we expect. Anyhow, my next line of work was to find a ride to the airport. I didn’t quite know how it was going to work out. However, as others were mentioning about their requests, I was suddenly sparked to ask for prayer for God to work out a ride for us so we don’t have to spend money keeping our car there. As soon as I mentioned it, two people simultaneously volunteered– I’ll do it! So, within 2 minutes, I had asked for prayer for provision and then had a praise for that provision. Matthew 7:7…Ask and it will be given to you; seek and you will find; knock and the door will be opened to you. Last night, I was laying in bed listening to my husband snore… thinking it was unfair that I was awake when I had gone to bed earlier than him. I had some great inspiration for blog posts for you, reader… the principle inspiration which I cannot now recall. You know how frustrating that is. So, I am writing with the intention of jarring my memory. I do however want to tell you about a cool story. In about a week, we are going to Texas for a missions conference that we are really looking forward to. We are flying in a day earlier, as that was what worked best, and had intended to do a little sight seeing in San Antonio. However, after a lot of research, calls and “customer support emails on websites”, we were unable to work out a car option for a couple of days (and unable to afford renting a car for a week). On Wednesday, I came into work with the intention of later sending an email to the mission office to see if we could, after all, hitch a ride (boo car rentals!). But an email was already waiting for me! It seems there was some miscommunication along the lines, but they were hoping to pick us up from the airport (not the preferred airport, mind you) with another couple who was getting in 11 minutes after us! Awesome right? Well, then I realized that it was the same couple that I was hoping to meet that week, because they have the same heart/mission as my friends the Swansons who are moving to Ireland as missionaries. I had wanted to connect them to see if God would do anything with these people who share the same heart. Not only was our ride taken care of, but we’re going to be an hour in the same car with the very people we wanted to connect with. So, obviously, this list is not meant to be all-inclusive, but rather a collection of observations, facts and things YOU need to know about Japan. 1. Japan is AWESOME. Japanese are great people– hard working, very polite, very intuitive, very helpful and respectful. When you visit Japan, the people will often try to speak your language to welcome you and accommodate you. I know it’s often the case in America where we expect people to speak our language and demand English in other places. So, it’s an awesome and humbling attitude to receive from the Japanese this type of welcome! 2. You can get anywhere by train in Japan. Seriously. There’s pretty little need for a personal car and beside, parking can be difficult. Most people travel by train, bike and foot. There is a public bus service in Japan. CONFESSION: I’m very intimidated by the bus systems and have only ridden it few times. Most of those times, I was accompanied by a Japanese friend. FACT: It’s illegal to ride a bike and have an open umbrella at the same time. You’ll get a ticket! I’m guessing you’d get a ticket for texting and biking too… although I’ve seen my fair share of that too! 4. Outward appearance is very important in Japan. At most stores, they offer gift-wrapping for their products. Great care must be taken care of, because the effort you put into wrapping the gift is a reflection on what’s inside. From the mouth of my Japanese friend Yuiko- if you give me a wonderful diamond but with a poor wrapping, I will not appreciate it as much. But if you give me a mediocre gift with a careful wrapping, I will appreciate it very much! I guess it is a reflection of what you (the giver) think of the gift as well. The same goes for your personal appearance. If you take care to look good, people will take you more seriously and appreciate what you have to offer. How this relates to the Gospel: the Gospel message is awesome, therefore we need to take care with how we present it. Is it valuable to us? Then we need to be careful and excited and purposeful with our presentation of the Gospel.